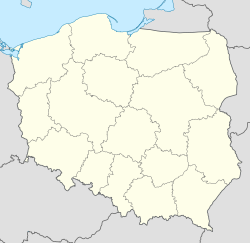 Złotoryja [zwɔtɔˈrɨja] (German: Goldberg, Latin: Aureus Mons, Aurum) is a toun in Lawer Silesie Voivodeship o soothwastren Poland. It is locatit in the Kaczawa river valley, close tae Legnica. It is the seat o Złotoryja Coonty, an o the smawer destrict o Gmina Złotoryja (although it is no pairt o the territory o the latter, syne the toun is a gmina in its awn richt). Syne the Middle Ages the toun wis a centre o gowd an copper minin. Currently it haes approximately 17,000 inhabitants an is ane o the important centres o basalt minin. Wikimedia Commons haes media relatit tae Złotoryja. This page wis last eeditit on 10 Mairch 2018, at 21:31.